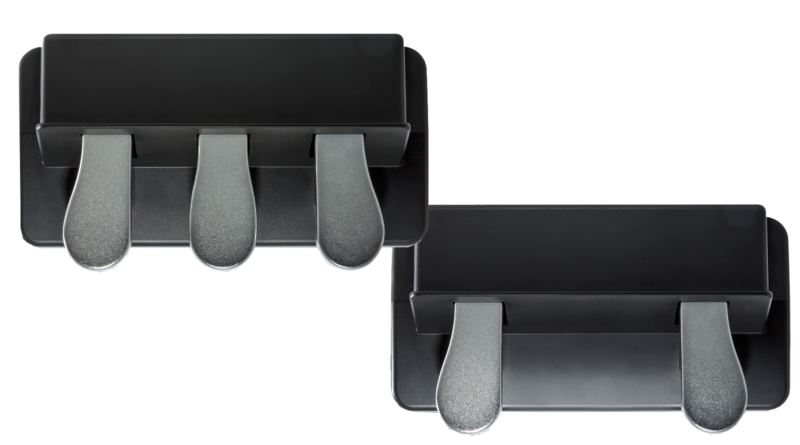 The SP-Dual and SP-Triple foot pedals are double and triple pedal units for use with MIDI keyboards. This article discusses some common questions regarding the functionality and use of the pedals. Will the SP-Dual or SP-Triple work with my keyboard? Why would I need two or three pedals? How can I tell which cable goes to which pedal? The keyboard is sustaining when the pedal is released. What do I do? The SP-Dual and SP-Triple pedals are built to function with nearly any MIDI keyboard that has multiple pedal inputs. The SP-Dual pedal performs all the standard soft and damping functions while the SP-Triple pedal performs all the standard soft, sostenuto, and damping functions. If you are unsure if you can use two or three pedals, just check the back of your keyboard for available inputs or ask the keyboard manufacturer. The SP-Dual has two and the SP-Triple has three momentary non-latching foot pedals that allow for the ability to be connected and assigned to keyboards that have multiple pedal input connections. MIDI controller pedal inputs can often have the functionality of the port re-assigned. This is dependent upon the controller. In some cases, there are many options to choose from - and those options such as sustain, etc. that can be controlled by a momentary, non-latching foot switch can be assigned. Why would I need two or three foot pedals? Some keyboards have multiple foot pedal inputs. Sustain inputs are fairly common, but some MIDI keyboards will also have an input for expression pedals. An expression pedal input can be used to send additional information to your keyboard or software to modulate a particular effect by using your foot instead of taking your hands off of the keys. The expression pedal can usually be assigned to an effect somewhere in your keyboard or software. In addition to sustain and expression, some keyboards may have particular inputs like "organ swell" that are specific to their model. Usually these are standalone keyboards that emulate organs or pianos and provide the option to add additional sustain pedals to make the experience more realistic. Typically pianos have several pedals with different functions, sometimes just different versions of sustain pedals, and some keyboard manufacturers may want to emulate this. The SP-Dual has (2) 1/4" outputs, one for each of it's pedals. The left and right connections are labeled on the cable at the point where the connection splits as L and R, respectively. The SP-Triple has (3) 1/4" outputs, one for each of it's pedals. The left, right, and center connections are labeled on the cable at the point where the connection splits as L, C, and R, respectively. The pedals will not have a switch to change polarity and will operate as Normally Open. Sustain pedals act similar to a basic circuit, so saying the sustain pedal is Normally Open is saying that the circuit is open while the pedal is up, i.e. the circuit is disconnected and the flow has been stopped. Whereas, a Normally Closed pedal will close the circuit in it's up position, i.e. the circuit has been connected and electricity can flow openly from one point to the next. This means that connecting a normally open pedal to a keyboard expecting normally closed may result in the keyboard sustaining until the pedal is pressed down. Different manufacturers may program their keyboards to respond one way or the other, while others even design the keyboards to adapt to the preference of the pedal. Just in case, some pedals may come with a switch to change their polarity, but even still there are ways around this without the need for a switch. If you're unsure, you may want to contact your keyboard's manufacturer to see which position they prefer. Hold down the pedal while powering the keyboard on. Depending on the keyboard, this could trick the board into thinking the pedals down position is the up position and vice versa. Alternatively, you can try plugging in the pedal after the keyboard has been turned or holding the pedal down while plugging it in while the keyboards is on. One of these should work with virtually any keyboard to switch the response back and forth. Use your best judgement to assign this accordingly. A lot of keyboards have the ability to change Min/Max (up/down) values or polarity of the pedal inputs from their standard editing features or global parameter menus. For example, the M-Audio Code keyboards give users the ability to change the max/min values by using the Edit mode and adjusting the Data 2 and Data 3 values. Check with your keyboard manufacturer to see if this is an option with your board. If you are using the keyboard with a DAW or virtual instrument, sometimes the software response can be adjusted to match the polarity or min/max value of the pedal input. Check with the software provider for more info on this.